Captain Wentworth’s diary is one of the diaries of Jane Austen heroes written by Amanda Grange. 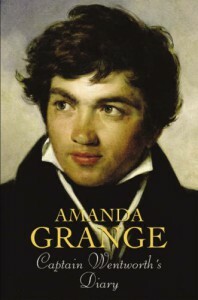 This is the fourth Amanda Grange novel for me, and I truly enjoyed it like I did with the previous novels as well. The reviews to the previous Amanda Grange titles I’ve read can be found from these links:Captain Wentworth’s diary first gives us a glimpse to things that happened when Captain Wentworth and Anne first met and fell in love. The events of that summer are described with much of passion and the love Captain Wentworth feels for Anne is very visible. They get engaged, and Wentworth has many plans for their future. Suddenly Anne says that they cannot remain together. Wentworth’s word is crushed and he goes to the sea to get his mind away from Anne. He wants the sea to be his only mistress.Eight years later, Wentworth is a wealthy man back in England. His sister and her husband have rented a house from the English country house. Subsequently the house is Kellynch Hall, the home of Anne, Wentworth’s previous love interest. When Wentworth and Anne meet again, Wentworth tries to hide his feelings and rather tries to show Anne that he is over her. But as we all know, in the end, Wentworth and Anne get each other. But by reading Captain Wentworth’s diary we get to see how things proceeded according to the hero of Jane Austen’s Persuasion.This novel was an interesting read because I have always liked Captain Wentworth but I feel that I have never learned that much about his character. Through this novel I was able to see a side of him which supports perfectly the description of him by Austen. As the other Austen hero diaries by Grange, also this one is very emotional and passionate; it is interesting to see how these men who are not able to manifest their passion because of the societal standards put their passion into the pages of their diaries. I think Grange succeeds well this aspect.Captain Wentworth’s Diary by Amanda Grange is a must read for all fans of Austen and everything related to her.